Wahama senior Noah Litchfield (33) releases a shot attempt during the second half of Tuesday night’s TVC Hocking boys basketball contest against Trimble in Mason, W.Va.
MASON, W.Va. — The turnover bug bit the White Falcons again. 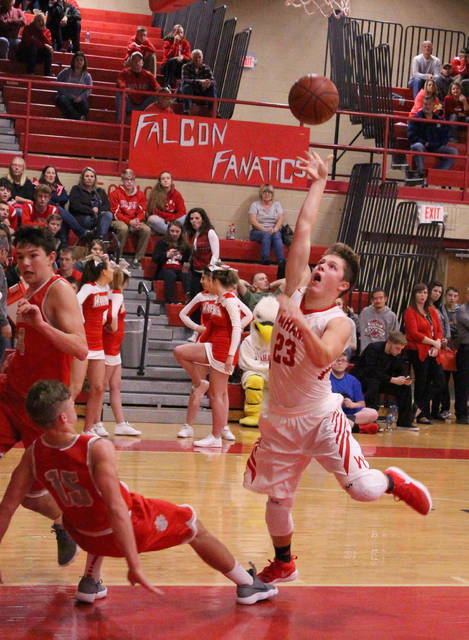 Visiting Trimble forced 26 total turnovers and had 24 extra shot attempts on Tuesday night en route to a 60-37 victory over the Wahama boys basketball team in a Tri-Valley Conference Hocking Division matchup at Gary Clark Court in Mason County. The host White Falcons (0-4, 0-3 TVC Hocking) stormed out to a 13-4 cushion on 4-of-5 shooting over the opening five minutes of regulation, but the Tomcats (4-0, 4-0) turned up the pressure in forcing seven first quarter miscues while making a 13-2 surge over the final 2:36 of the canto — allowing the guests to secure a slim 17-15 edge through eight minutes of play. From there, the night practically belonged to THS — starting with a low-scoring second period. The Tomcats hit consecutive baskets 75 seconds into the second frame to take a 22-15 cushion, but the Red and White answered with a Noah Litchfield bucket at the 6:37 mark to close back to within two possessions. Brayden Weber followed with a basket at the 5:49 mark that again stretched the lead back out to 24-17, then Wahama committed its third turnover of the period eight seconds later. Then, a chess match broke out on Trimble’s following possession. With WHS sitting back in a 2-3 zone, the Red and Gray elected to hold the ball in the backcourt before the White Falcons extended the zone to pressure the ball. THS answered with intense ball movement over a 5:35 span, electing to take a single lone shot with six seconds left in the half. 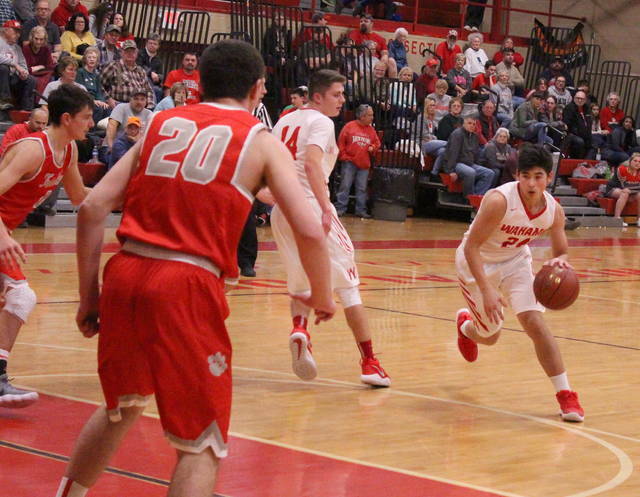 The shot ended up hitting the rim and going out of bounds with six second left, but Wahama followed with another turnover that gave the guests one final possession with just over three seconds left in the half. THS ultimately came up short on that offensive chance as well, but the Tomcats still managed to take a 24-17 edge into the break. Wahama had as many shot attempts in the first half (11) as turnovers, while Trimble committed only two miscues and attempted 23 shots from the floor in that same span. The guests also had a 10-6 edge in makes, with both teams hitting three trifectas. The White Falcons had the wheels fall off in the third frame after committing nine turnovers, and the Tomcats netted 11-of-21 field goal attempts as part of a 24-12 surge — making it a 48-29 contest headed into the finale. Trimble led by as many as 29 points (60-31) following a Randy Hixson trifecta with 4:38 left in regulation, but Wahama answered with consecutive three-pointers from Abram Pauley and Jonathan Frye to wrap up the 23-point outcome. THS outrebounded the hosts by a sizable 34-19 overall margin after being tied at nine boards apiece at halftime. The guests — who committed only 12 turnovers — also claimed a 20-3 edge on the offensive glass. Wahama connected on 15-of-34 shot attempts for 44 percent, including a 5-of-11 effort from three-point range for 45 percent. WHS was also a perfect 2-of-2 at the free throw line. Litchfield led the White Falcons with a game-high 22 points, followed by Tyler Bumgarner with seven points. Frye and Abram Pauley both chipped in three markers, while Isaiah Pauley completed the scoring with two points. Bumgarner hauled in a team-best eight rebounds, while Litchfield and Skyler Estep respectively grabbed five and two caroms in the setback. Trimble netted 26-of-58 field goal attempts for 45 percent, including a 6-of-16 effort from behind the arc for 38 percent. The guests were also just 2-of-12 at the charity stripe for 17 percent. Cameron Kittle led THS with 19 points and eight rebounds, followed by Max Hooper with 12 points and Weber with 11 markers. Hixson was next with nine points, while Bryce Richards and Conner Wright completed the winning tally with respective efforts of six and three markers. 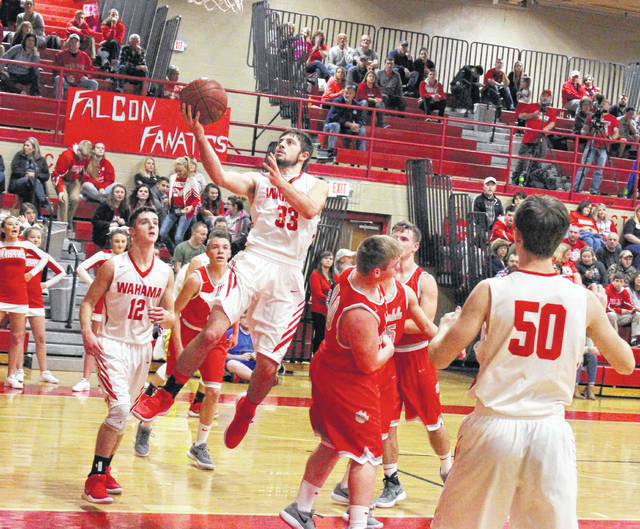 Wahama returns to TVC Hocking action Friday when it travels to Mercerville to face South Gallia at 7 p.m.